An olive barring give these strips a great fishy look. 1/8" Olive Barred Rabbit Zonker Strips Olive/Chartreuse. 1/8" Olive Barred Rabbit Zonker Strips Olive/Lt. Olive. 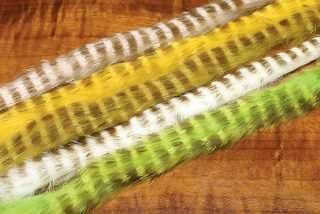 1/8" Olive Barred Rabbit Zonker Strips Olive/Yellow.